The Vietnamese painter Dang Van Can was born in 1957 in An Duc commune, Long Ho District, Vinh Long Province, the place is located along riverside of Mekong river in Vietnam. He showed an early talent in drawing and painting. He commenced to art works since 1976 with main job as a illustrator for local newspaper and magazine. Dang Can is a member of Vietnam Fine Arts Association. He has many paintings in Private Collection in many countries. For that, step by step, it has brought him to the public who like to take the delight in art. 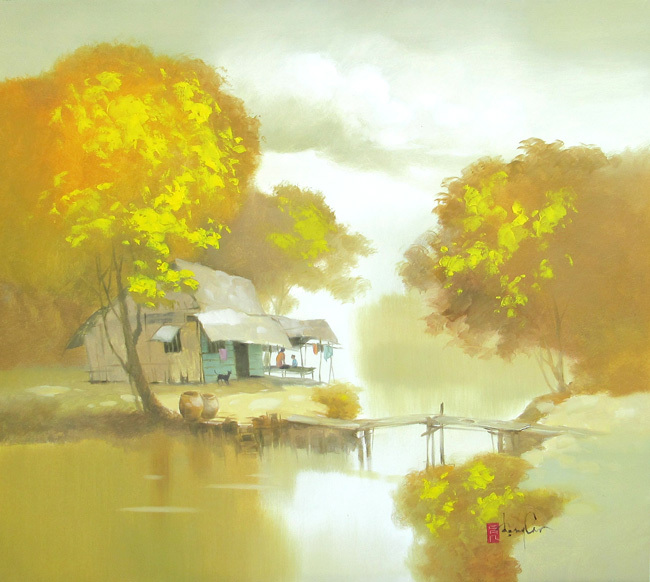 His style of painting is not only very soft, deep but also very attractive in the peacefulness of Mekong Delta. His paintings bring a full and semplice dream, to be imbrued with poetry, high-faluting but also reality. The main subject throughout his works are the landscapes in peaceful countryside of Mekong delta, the school girl in Aodai, the daily changing of local residents. It’s really simple but also very lovely. Beside painting, he is also a composer/ designer in art of ceramics. He used to take part time job for Art Ceramic Workshop in Vinh Long where the art ceramic products are famous for exporting to many countries in the world. Looking Can’s art works, we couldn’t stand taking emotionless or nonchalant because he took us to the natural living in the lower section of Mekong river. He wants to show us the human conditions, the sublimates of daily living as well as the lovely sceneries and the reform of our country day by day. Time to time he will show us more beautiful paintings and he is also a great artist in the Mekong Delta area.